Mix peanuts, coconut oil and honey together in a blender until smooth and creamy. Place in an airtight container and place in the fridge to settle for a day or two. Note: for crunchy peanut butter, leave 100 g of peanuts out, and add it only once the mixture is smooth. Blend it for a bit to get smaller pieces. 116 members have added this recipe to their cookbook. Yummy low GI breakfast or snack for the whole family (even those not watching their weight!). A easy and quick to prepare snack. 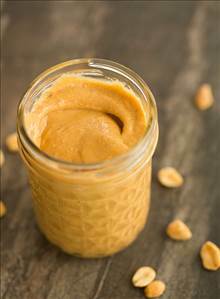 There are 91 calories in 1 serving of Homemade Peanut Butter. Calorie Breakdown: 71% fat, 15% carbs, 15% prot.